Arthur Pawloski shows some of the props that have already been purchased for this year’s Stampede Parade. 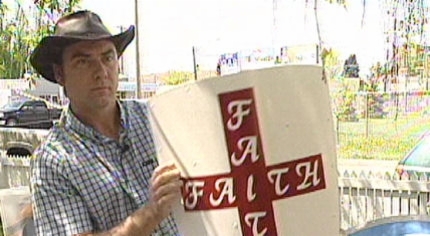 A controversial Calgary preacher says the Stampede is refusing to allow his church to join the Stampede Parade. Arthur Pawloski runs Street Church Ministries and says his right to free speech is being violated. "Christian community is part of what Calgary is. It’s part of the heritage of this country and it’s very important for the Christian community to be represented in that parade and also we represent the poor," says Pawloski. Members of the church say they’ve already spent $20,000 on props, costumes, and horse-drawn carriages for this year’s parade entry. The Stampede Committee says it won’t allow Street Church to participate in this year’s parade because of rule violations from last year. The committee says members of the ministry broke the rules when they passed out pamphlets to parade spectators. They didn’t play by the rules and regulations that we set out for all entries," says David Swanson, a spokesperson for the Stampede Committee. "And I’d like to point out that simply making an application to be in our parade doesn’t guarantee anybody’s acceptance into our parade." Pawlowski argues his ministry was told they could distribute pamphlets, by on-site parade officials, and says he’s being targeted because of his outspoken religious beliefs. The Calgary Stampede says the decision has nothing to do with religion and is about respect for the rules.